Booker T was recently honored with the Lou Thesz Award by the Dan Gable Pro Wrestling Museum. Hannibal TV caught up with Booker T during the event and asked the five-time World Champion if he still has political aspirations. "I got my name in the hat for 2019 Mayor of Houston, Texas," Booker T said. "The great city of Houston. I got a lot of you know bumps in the road. I got a lot of landmines I gotta figure out how I'm gonna get past. My past is checkered, of course. Everybody knows the Book is an open book." 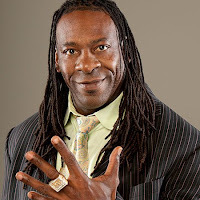 Booker T announced on December 13th, 2016 that he intends on running for Mayor of Houston in 2019. Via a public announcement on Twitter, the WWE Hall Of Famer said, "I look forward to having a dialogue with the voters of Houston and if I am so privileged to serve, I will fight for them as hard as I fought for myself and my family over the last 30 years." Booker T wants to nourish the future through the young people he is able to influence. He isn't the only WWE Superstar with his eyes set on the Mayor's office as Kane is waiting for the August 2nd election when he hopes to become the next Mayor of Knox County Tennessee. "To be able to make a difference in one life is really what I'm all about," Booker T continued. "To make a change. People say 'respect your elders,' but I always go, 'respect your young people because they are our future.' So I look forward to seeing what happens." Booker T was also asked about an old backstage battle in 2006 with Dave Bautista. During a 2013 interview with Wrestling Inc. Booker T spoke about his backstage confrontation with the Guardians Of The Galaxy star. "I never had a problem with him or anything," Booker T said to Wrestling Inc. "I mean, certain things once you get into the business -- and I'm all about tradition and I'm all about respect as far as the guys that came before me and put in work. That pretty much was what that thing was about, it was about respect not just for myself but for all of the rest of the boys in the locker room. "That's just the way things happen, a lot of testosterone in the locker room and we all don't get along. We all don't like each other, we just have to work with each other. Sometimes, fights will break out and that's what happened with him and I. We're both men and, sometimes, men fight." Booker T's story hasn't changed much in five years when asked about his backstage brawl with Batista. He told Hannibal TV that his altercation with The Animal amounted to a testosterone-filled disagreement. Booker T and Batista are okay with each other now as the two have since settled their disagreement. "You know in professional wrestling, I'm sure in combat sports there's always gonna be testosterone," Booker T said. "Men a lot of times don't agree with each other and that's all it was. It was a disagreement. Him and I, we settled our disagreement. If I saw him today, he'd get a big hug and I'd say, 'what's going on?' You know? He's a man, just like I am."